Better grab your hat, folks, and hang on for your life. This is one crazy ride out to the northern tip of Cozumel, Punta Molas. 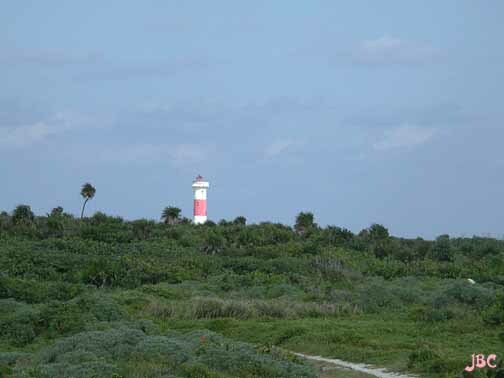 You HAVE to rent a 4 wheel drive vehicle to get to this desolate lighthouse. I tried two days earlier with a 2 wheel drive Jeep and was stopped at the 150 foot long sand trap that was the road. It had taken me an hour to go 5 miles and I wasn't even a third of the way. It is pure jungle all the way out along the coast and a spectacular coast, I must say. White sand and turquoise water, tropical blue skies, and this hairy road, a combination sand, dirt, plant, and coral. And big holes. Close your eyes and think Jurassic Park. We went through some open stretches where you could see the coast and then there were times when you couldn't see anything but the jungle and the road, even then the road seemed to disappear at times. Three hours later we arrived at the end and were greeted by a small squad of military types that were stationed at the lighthouse. They spoke Spanish, we English, though we did get across the idea that we wanted to go up, which they let us do. Faro is the Spanish word for lighthouse, by the way. It is the first lighthouse I have visited that had an armed guard at the top. With an automatic weapon, no less. 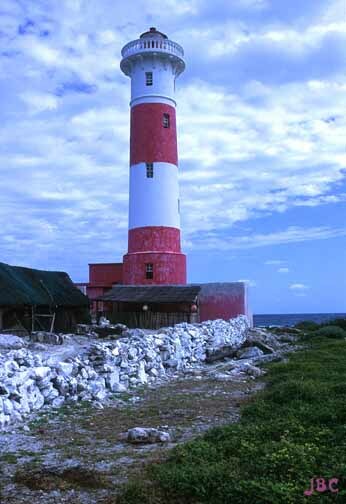 This lighthouse had a lens like Punta Celarain, only it was broken in pieces on the floor of the lantern room. Now an aero-beacon provides the light. Powered by a large battery which they recharge with solar panels. They keep two batteries. There were what appeared to be buildings connected to the tower but they were unfinished or half demolished and unoccupied. The barracks for the military guys is a makeshift thing with tarps. Isolated. I took their picture and showed it to them on the display of my digital camera and they gave me a pristine little conch shell that still had a good bit of the critter that recently inhabited it. It still stinks. Be prepared for a bone jarring ride out there and start early. Have a full tank of gas. Keep in mind that insurance coverage on rental vehicles ends when you leave paved road. There are large mosquitoes, very thirsty and could probably drain you in a few minutes if you let them. It smelled like that had happened to some unfortunate critter at one place along the road, where the jungle grew over it and was like a tunnel. Several big vultures took off in flight and then there was that smell. What a deal, mosquitoes and vultures working together like that.